Yosemite National Park is a U.S. national park largely in Mariposa County, and Tuolumne County, California, United States. The park covers an area of 1,189 mi² (3,081 km²) and stretches across the western slopes of the Sierra Nevada mountain range. 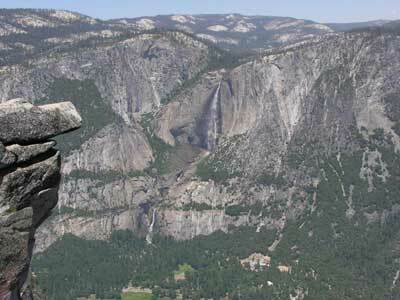 Over 3 million people visit Yosemite each year, with most only seeing Yosemite Valley. Designated a World Heritage Site in 1984, Yosemite is internationally recognized for its spectacular granite cliffs, waterfalls, clear streams, Giant Sequoia groves, and biological diversity (about 95% of the park is designated wilderness area). It was also the first park set aside by the U.S. federal government and through the work of people like John Muir was a focal point in the development of the national park idea. Yosemite National Park is located in the central Sierra Nevada of California. It takes 3.5 hours to drive to the park from San Francisco and about six hours from Los Angeles. Yosemite is surrounded by wilderness areas: the Ansel Adams Wilderness to the southeast, the Hoover Wilderness to the northeast, and the Emigrant Wilderness to the north. Yosemite is one of the largest and least fragmented habitat blocks in the Sierra Nevada, and it supports a diversity of plants and animals. The park has an elevation range from 2,000 to 13,123 feet (600 to 4000 m) and contains five major vegetation zones: chaparral/oak woodland, lower montane, upper montane, subalpine and alpine. Of California's 7,000 plant species, about 50% occur in the Sierra Nevada and more than 20% within Yosemite. There is suitable habitat or documented records for more than 160 rare plants in the park, with rare local geologic formations and unique soils characterizing the restricted ranges many of these plants occupy. The park has three groves of ancient Giant Sequoia (Sequoiadendron giganteum) trees; the Mariposa Grove (200 trees), Tuolumne Grove (25 trees), and the Merced Grove (20 trees). Giant Sequoia are the most massive trees in the world and are one of the tallest and longest-lived (Coast Redwoods that live along the Northern Californian coast are the tallest and the Great Basin Bristlecone Pine of Eastern California are the oldest). These trees were once much more widespread before the last Ice Age began (Geology of U.S. Parklands, page 227). Yosemite Valley is open year-round but much of the rest of the park is closed due to snow in late fall and does not open until mid to late spring. Open-air tours around Yosemite Valley and the Mariposa Grove of Giant Sequoias are available. Many people enjoy short walks and longer hikes to waterfalls in Yosemite Valley or walks amongst Giant Sequoias in the Mariposa, Tuolumne, or Merced Groves. Others like to drive or take a tour bus to Glacier Point (summer-fall) to see a spectacular view of Yosemite Valley and the high country or drive along the scenic Tioga Road to Tuolumne Meadows (summer-fall) and go for a walk or hike. Most people who enter the park only stay for the day and only visit locations within Yosemite Valley that are easily accessible via their automobile (as of 2005 there is a US$20 fee per automobile to enter the park). Traffic congestion in the valley is therefore a serious problem during the peak visitation season, summer. A free shuttle bus system operates year-round in the valley, and park rangers encourage people to use this system since parking within the valley during summer is very often not possible to find. Almost all the park, however, is highly protected roadless wilderness that does not allow any motorized vehicles and requires permits for overnight stays (many restrictions apply, rangers will inform you of these). The geology of the Yosemite area is characterized by granitic rocks and remnants of older rock. About 10 million years ago, the Sierra Nevada was uplifted and then tilted to form its relatively gentle western slopes and the more dramatic eastern slopes. The uplift increased the steepness of stream and river beds, resulting in formation of deep, narrow canyons. About 1 million years ago, snow and ice accumulated, forming glaciers at the higher alpine meadows that moved down the river valleys. Ice thickness in Yosemite Valley may have reached 4,000 feet (1200 m) during the early glacial episode. The downslope movement of the ice masses cut and sculpted the U-shaped valley that attracts so many visitors to its scenic vistas today. Almost all of the landforms in the Yosemite area are cut from the granitic rock of the Sierra Nevada Batholith (a batholith is a large mass of intrusive igneous rock that formed deep below the surface). About 5% of the park (mostly in its eastern margin near Mount Dana) are from metamorphosed volcanic and sedimentary rocks. These rocks are called "roof pendants" because they were once the roof of the underlying granitic rock. Tuolumne and Merced River systems originate along the crest of the Sierra Nevada in the park and have carved river canyons 3,000 to 4,000 feet (900 to 1200 m) deep. The Tuolumne River drains the entire northern portion of the park, an area of approximately 680 square miles (1760 km²). The Merced River begins in the park's southern peaks, primarily the Cathedral and Clark Ranges, and drains an area of approximately 511 square miles (1320 km²). Along much of Yosemite's western boundary, habitats are dominated by mixed coniferous forests of Ponderosa Pine, Sugar Pine, Incense-cedar, White Fir, and Douglas Fir, and a few stands of Giant Sequoia, interspersed by areas of Black Oak and Canyon Live Oak. A relatively high diversity of wildlife species are supported by these habitats, due to relatively mild, lower-elevation climate, and the mixture of habitat types and plant species. Wildlife species typically found in these habitats include Black Bear, Bobcat, Gray Fox, Mule Deer, Mountain Kingsnake, Gilbert's Skink, White-headed Woodpecker, Brown Creeper, Spotted Owl, and a wide variety of bat species. In the case of bats, large snags are important as roost sites. As the landscape rises, trees become smaller and more sparse, with stands broken by areas of exposed granite. These include Lodgepole Pine, Whitebark Pine, and Mountain Hemlock that, at highest elevations, give way to vast expanses of granite as treeline is reached. The climate in these habitats is harsh and the growing season is short, but species such as Pika, Yellow-bellied Marmot, White-tailed Jackrabbit, Clark's Nutcracker, and Rosy Finch are adapted to these conditions. Also, the treeless alpine habitats are the areas favored by Sierra Nevada Bighorn Sheep. This species, however, is now found in the Yosemite area only around Tioga Pass, where a small, reintroduced population exists. At a variety of elevations, meadows provide important, productive habitat for wildlife. Animals come to feed on the green grasses and use the flowing and standing water found in many meadows. Predators, in turn, are attracted to these areas. The interface between meadow and forest is also favored by many animal species because of the proximity of open areas for foraging and cover for protection. Species that are highly dependent upon meadow habitat include Great Gray Owl, Willow Flycatcher, Yosemite Toad, and Mountain Beaver.